I don’t know how, but one of the most memorable events of 2013 is going to be the Great Sewing Space Redo (version 4.5). I am fortunate to have the second bedroom in the house serve as the combined office/studio space, and it has wonderful light. That’s where I sew now – it hasn’t always been this large or this sunny. And even though the space is generous, it had layout issues (well, up until Thanksgiving weekend it did). Kids, I don’t recommend doing this on top of every thing else the weekend after Thanksgiving – but I often find the long way around the barn. I’ve recently come into possession of about 30 odd years of photo albums and memorabilia – my mom has downsized and I brought them home until we could figure out what to do with them. The plan is to scan them into the computer, and then make a memory book with them. Problem #1 (solved) was that the ironing board was a permanent fixture in front of the scanner…not much of an issue when you scan once or twice a week, but when you’re looking at the volume I am, it is a problem. Mike solved that by retrofitting my cutting area with a discarded island that now serves as both cutting and ironing…and since we had everything in storage, it was a $0 makeover…love that. This storage unit started life as a part of our family room – my sons will remember when it was painted Barn red, and the bins held puzzles and matchbox cars. The space underneath was designed by my husband so that they could ‘park’ their riding toys at the end of the day. 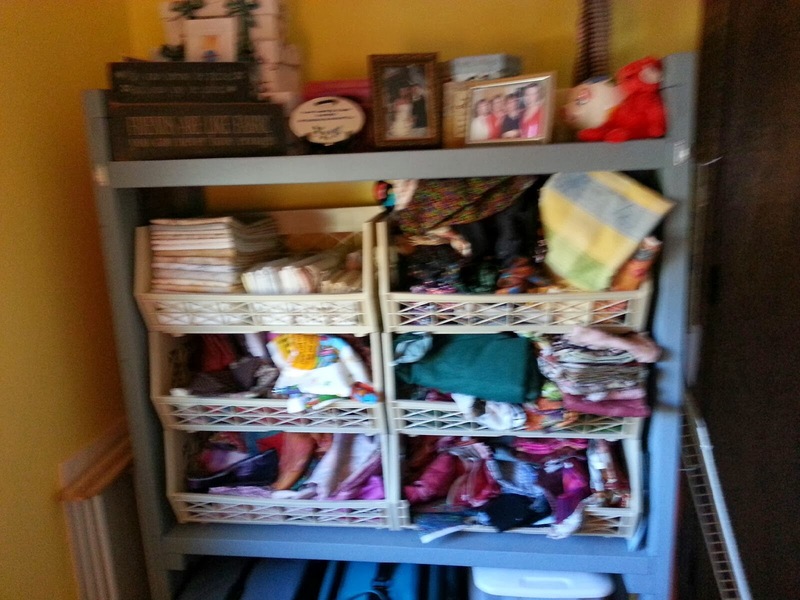 I LOVE this unit in the sewing room because it now provides easy access to my rolling cases for machines to take to classes. And with the new paint, peg board on the side(s) and a new shelf on top…it was perfect. 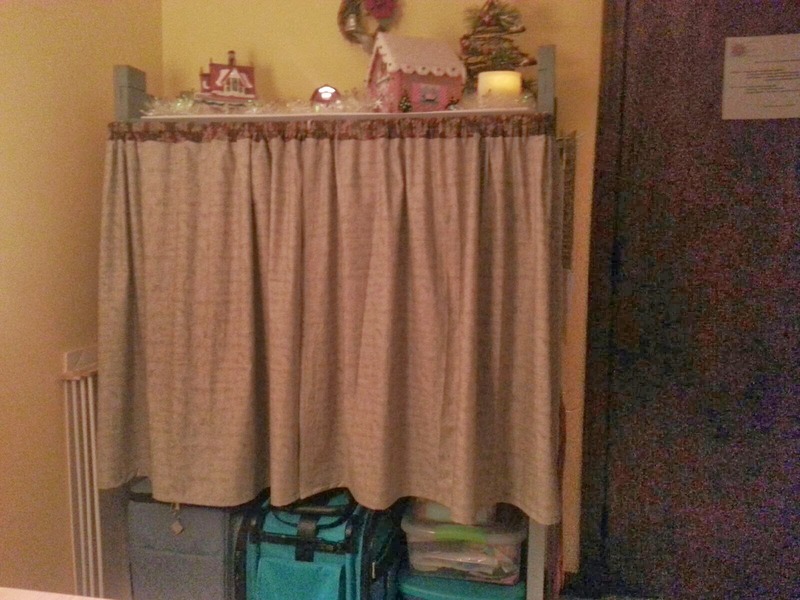 I even added a curtain rod to go in front of the open space…to protect the fabric from sunlight. Or to protect the innocent (?) from dealing with the effects of too much fabric. When I removed the curtain, this was laid bare in all it’s ugliness…with no blue and no batiks visible (there’s a large pile on the floor, out of camera range), I knew this had long ago become a mess. My husband is quite handy, and I casually mentioned over coffee in the morning that I needed to hire a handyman, because I needed some shelves built. For now, I leave you with this Christmas-y corner of the sewing room. The next blog installment will be…”Hello, my name is Linda and I’m a Bin-o-holic”. ← Thanksgiving wishes for you all!